Senior Infant Adventures in Learning: Crazy about Clothes! Hi everyone, I'm back again with another thematic unit, this time based on the topic of clothes. Hope you find it useful in your planning! I have tried to include as many useful resources as possible! Some children tried on a sari, a furry coat and a kilt and we all tried to see if we could remember which country they are worn in! We then wrote in the country names under these pictures (with help from the board!) and coloured them in beautiful bright colours! 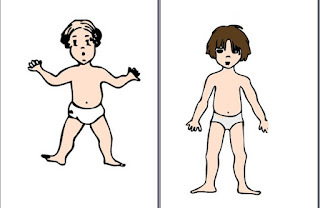 We talked about how different the clothes we wear now are to when we were babies. We talked about why we can't wear the same things babies/adults wear. 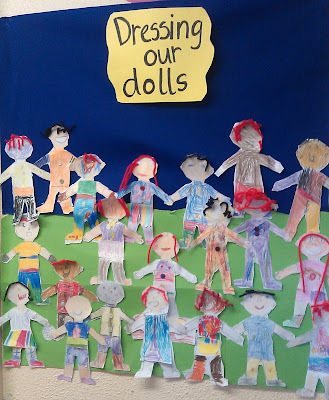 We dressed the paper dolls on the board (baby, child, adult) using clothes I got online, printed and cut out. Here are pictures of the paper dolls and their clothes. 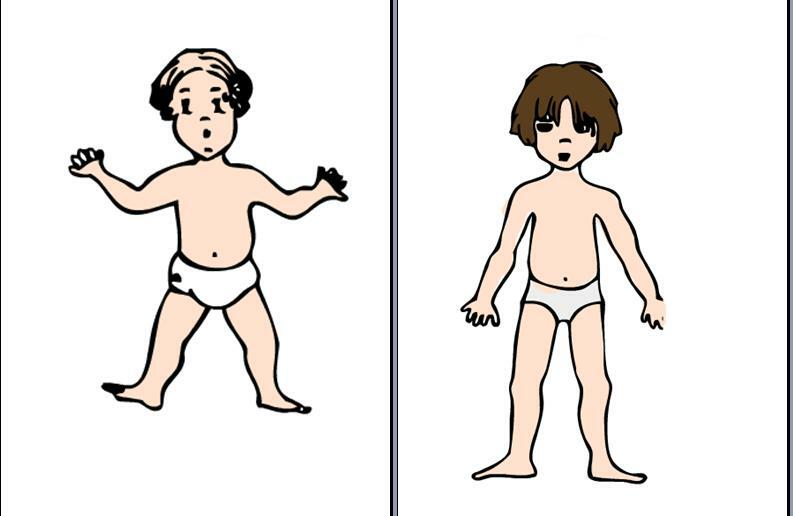 We then drew pictures of a child, baby and adult and the clothes they would wear and labelled them appropriately. We played a game where we had to run around the hall and touch different materials I called out. (Wood, plastic, metal, glass, cloth, touch something smooth, soft, rough, that can tear, that won’t tear etc). We then looked at some materials I had collected: Woolly jumper, leather runner, cotton t-shirt, furry collar, feather filled jacket and discussed whether the material was hard, soft, rough, smooth, would it tear, was it waterproof? Then I got them to walk to the picture of the animal/plant (laid out on the floor of the PE hall) that the material was made from. After we had discussed all this and they had identified the correct animal/plant for all objects I held up the items one at a time and they had to run to the correct picture. If they went to the wrong one they were out. We played this game about three times. It was really fun and a great end of the day activity! We discussed what kinds of clothes we wanted to draw/stick onto our paper doll templates. 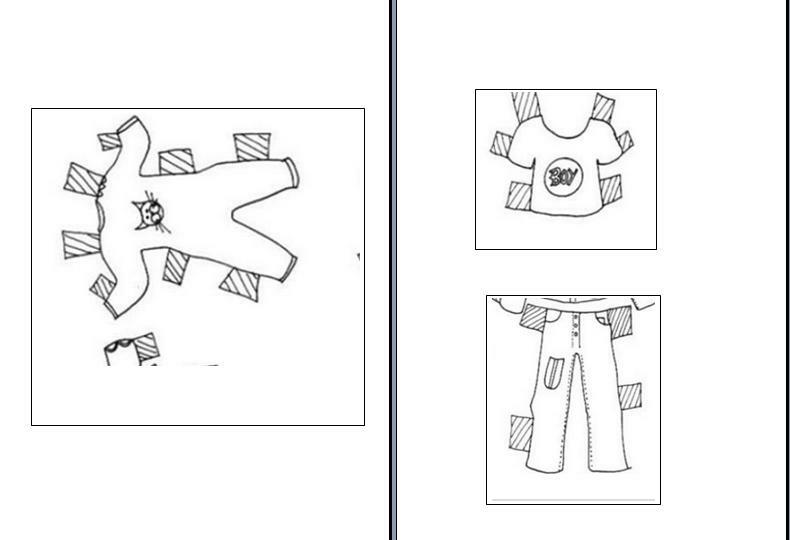 We designed trousers, t-shirts, jumpers, dresses etc for our paper dolls. We stuck on buttons and hair also to bring them to life. Here are our creations! We did píosa drámaíochta about an Cóchailín Dearg. 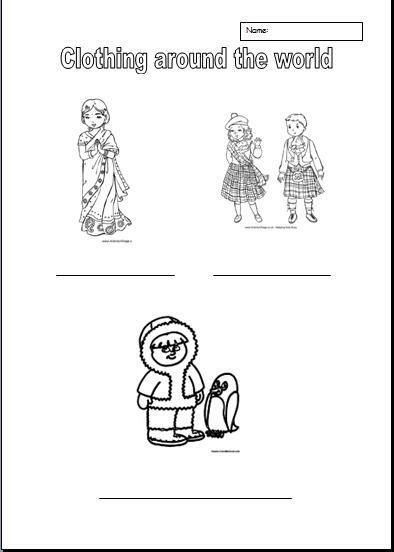 I got children to dress up in costumes (red cloak, wolf ears on a hairband, showercap, axe, apron, hat) to get in roll as the various characters in the story. They acted out the script as I read it. I made sure every child got a chance to act it out. (We also used this for practice on 'cé hé seo?'). Gradually they started to join in and understand various words in the script. Bhí an Cocailín Dearg sa bhaile. D'fhag sí slán le Mamaí agus le Daidí. Chuaigh sí go dtí an choill. Bhuail si leis an Mac Tíre. Bhí scanradh uirthi roimh an Mhac Tíre. Rith sí go dtí teach a seanmhathair. Chonaic sí a seanmhathair. (All join in) Oh, feach ar do shuile! Feach ar do chluasa! Feach ar do fhiacla! An Mac Tíre a bhí ann! Rith si amach an doras. Tháinig an gearrthóir adhmaid agus maraigh sé an mac tíre. Bhi an Mac Tíre marbh agus bhí áthas an domhain ar gach duine eile! There are just some ideas about teaching subjects around the topic of clothes, if you've got any others I'd love you to comment below! Happy Teaching!